Penny Press Machines MADE IN GERMANY! 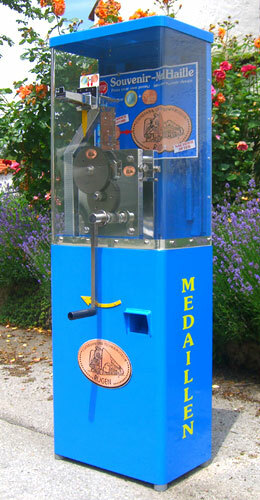 Press a souvenir medal yourself - the Penny Press Machine turns small coins into collectible souvenir medallions within a few seconds. A normal coin, e.g., a 5-Cent coin, is turned into an elongated coin - a wonderful souvenir for your customers! Our penny press machines are hand-cranked - no electricity required. Can be installed anywhere, indoors and outdoors. Needs only a small space. Clear window to view the pressing process. Very well protected money box. Low investment but high profit. 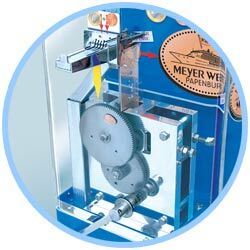 How can you aquire a Penny Press machine? You can buy a Penny Press machine from us and operate it yourself. If you are interested in our Penny Press machines, please contact us!